Gold Gals address, phone, website, and more. We specialize in getting you the most money for your unwanted, broken, or outdated gold and silver jewelry. At Gold Gals, we take the time to educate our customers through our personal approach to buying your jewelry and other precious metals. 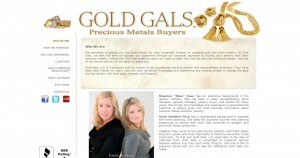 Contact the Gold Gals today or watch our video to learn how you can sell your precious metals. Visit one of our stores and we will be happy to assist you. Gold Gals, LLC is a company built by a team of two exceptional working women with extraordinary ambitions. They have been best friends for years and with their combined knowledge and experience are making strides to change the gold buying industry with hard work, honesty and integrity.